Our 2014 production, Sister Act was awarded Best Musical for the Nottinghamshire NODA region at the recent NODA East Midlands Regional Awards. 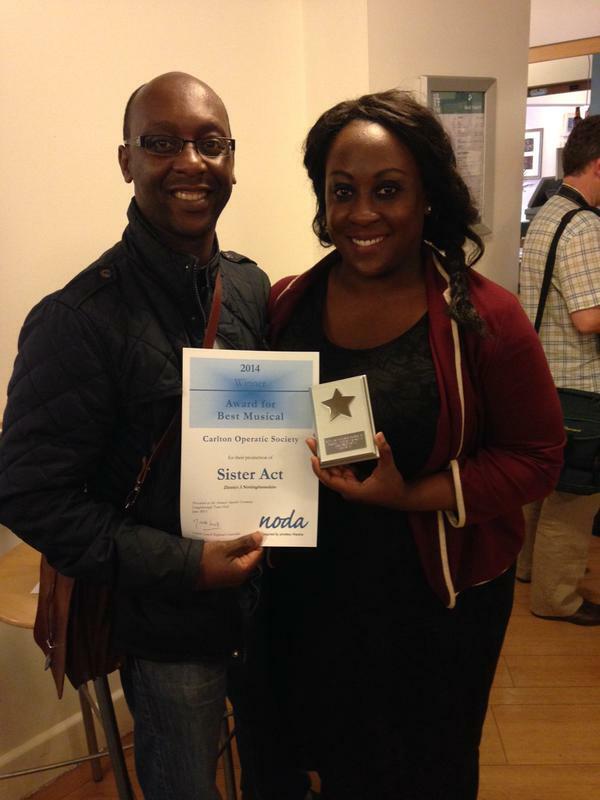 Monique Henry and Ray McLeod, our Deloris and Eddie, collected the award at a ceremony at Loughborough Town Hall on 14th June 2015. Fundraising efforts by the society, and collectors for the charity at the performances of our 2015 show, Legally Blonde, raised a whopping £1389.50 for local charity Rainbows hospice for children and young people, located in Loughborough. Thank you to all those who took part in the carol singing, and to everyone who generously donated to this fantastic charity. This year we are trying something new, by running some workshops about auditioning for new (and existing) members, with some hints and tips from our production team about what you should (and what you shouldn't) do in an audition for a musical theatre group and/or production. The workshops have been partly supported by funding we have received from the Nottingham Post as part of the "Cash for your Community" programme, so we are able to run them this year at a cost of £1 per person per session. We're running them over the course of 5 weeks – on the evenings of Thursday 3rd, 10th, 17th & 24th September, and Thursday 1st October. You do not have to attend every session, but the content will be different from week to week so to get the maximum benefit you should try to attend as many as possible. We will cover topics such as how to choose the right song, what the panel are looking for, and how to make the right impression in an audition. Although they are being run by Carlton Operatic Society specifically to help new members understand how to do their best in our new members auditions, we hope that they would prove useful to anyone wanting to audition for any show in any group. Following the workshops, we will be running the new members auditions for the 2015-16 season – our production for the season is the musical Grease, to be performed at the Nottingham Theatre Royal from 1st – 5th June 2016. These auditions will take place on Thursday 15th, 22nd and 29th October; more details on these will follow in a separate email. If you would like to take part in the workshops, please take a look at the information and then follow the instructions in the how do I get involved? section. Please contact us using those instructions as soon as possible, as there will be limited spaces available for each session. Carlton Operatic Society are looking for 2 loveable dogs to star in the up-and-coming regional premier of Legally Blonde the Musical. This show is known for its fun filled music, vibrant dance routines and two very talented dogs that are key to the show. Bruiser is a short-haired Chihuahua that looks perfect in Pink, while Rufus is a bulldog that is as lovable as can be. Now if your lovable pet is not this type of breed, please get in contact as we will consider all breeds of dogs. Director of the show Amanda Hall is calling out for two special dogs to play these key roles within the show. Auditions have taken place for the cast and rehearsals have now started. All that is left is to seek canine companions for the show. "I've got every faith that we will find our Bruiser and Rufus - it's just the last piece of the puzzle to complete. Both dogs need to be extremely loveable, both on stage and off. They will even have their own dressing rooms" said Amanda. Dogs and owners need to be available for the full week of the show from Tuesday 5th May to 9th May 2015 and attend rehearsal up to the run up of the show. It's a great opportunity for an owner and their dogs to take part in a fun show and also experience something that perhaps they have never done before. Legally Blonde will be showing at Nottingham Theatre Royal from Tuesday 5th May to 9th May 2015. If you would like to register your interest or want to know more, please contact Rachael Rees on 07811 976511 or email lbdogs@carltonoperatic.com. The cast of Carlton Operatic Society are getting fit for their next production Legally Blonde The Musical by skipping their way to fitness. Everyone is wanting to shed those few extra pounds that we have gained over Christmas and New Year but none more so than the cast of Legally Blonde who thought that joining a musical society would never have involved skipping! Well this fun packed show is a musical adventure with lots of dancing and singing. One of the hardest numbers to perform is a four minute song that involves various skipping combinations. This is proving to be an exciting number that has really meant that the cast have had to increase their fitness levels to enable them to get the number to the standard that is needed for the show. "I have not skipped since being at school, but I had forgotten how enjoyable skipping can be. We are having lots of fun and it really gets your heart rate up. We not only have to skip during my number ‘Whipped into Shape' but we also have to sing in four-part harmony, so it's testing all our skills at the moment. If you fancy losing a few pounds then skipping will certainly get you losing those inches!" "We have four months to get the cast ready for the show and that's not just learning their lines, songs and dances but it's also about getting them fit. Skipping is a cheap way of getting in shape that can be done at your own pace and in the privacy of your own space, so why not get out your skipping ropes and get fit this year. We would like people to tweet us their photos, success stories and achievements over the next four months using the hashtag #SkipMeFit, to share in the pain and reward with the cast!" Carlton Operatic Society will be fund-raising over the Christmas period for Rainbows hospice for children and young people, located in Loughborough. As the East Midlands' only hospice for children and young people, Rainbows is a place where life-limited children and their families can find care and support. The team at Rainbows Hospice helps relieve symptoms, improve quality of life, support parents and siblings through their bereavements and care for children until the end of life. Just like everyone else, children need a place to play, laugh and love life and Rainbows provide this to everyone they meet. A children and young people hospice offers children, young people and their families the chance to build memories as a family. Children that attend the hospice are diagnosed with a 'life-limiting condition'. This is a term which means the child's or young person's life will be shorted or they have a terminal illness and they are not expected to live far into adulthood. Many of these medical conditions continue over many years and get steadily worse. The hospice provides nursing and medical care that can help to relieve distressing symptoms caused by the child's or young person's condition. Care is offered for the whole family at the end of the child's or young person's life and while you are grieving. Carlton Operatic Society will be singing Christmas Carols at the following locations during December, please come and say hello and listen to some wonderful singing by the society and support this wonderful charity. 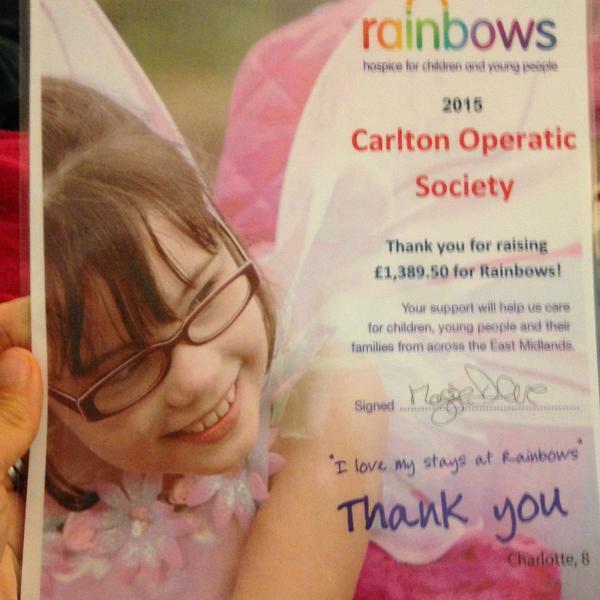 For more information about Rainbows please visit their website. 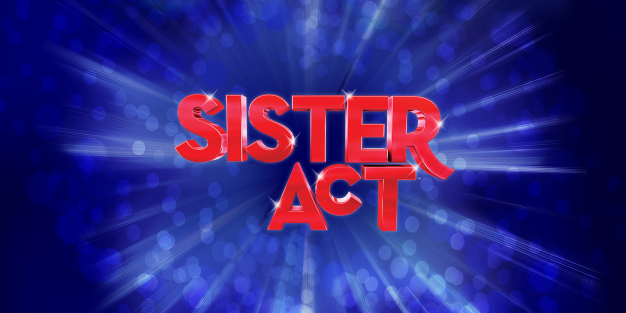 Audience figures for our recent production of the musical Sister Act were fantastic - we hoped it would be popular, but it has been our best-selling show ever. Thank you to everyone who came to support us - we had standing ovations at every performance, which left the audience and the cast on a high after every show. We were extremely privilege to be one of the first amateur productions of the show, based on the film staring Whoopi Goldberg, with music by Alan Menken, at the Nottingham Theatre Royal. You can read a selection of the wonderful reviews we had here. We even received best wishes from Whoopi Goldberg herself! Carlton Operatic Society was selected as one of the community groups that took part in the "Cash for Your Community" programme run by Nottingham Post in collaboration with Nottingham Building Society. £35,000 was available to successful community groups and to gain access to these funds the society had to collect as many tokens from the Nottingham Post as possible – tokens mean money! The funds we raise from this programme, will be used to encourage more involvement in Amateur theatre and for people to come and have a go singing, dancing and acting, with our existing membership. The funds will support a number of tailored workshops (existing members could also take part) that will develop skills and confidence, and give people of taste of what fun amateur theatre can be. Should we be lucky enough to gain enough funds we would like to hold a concert at a small venue that people from the workshops can take part in with our existing members. 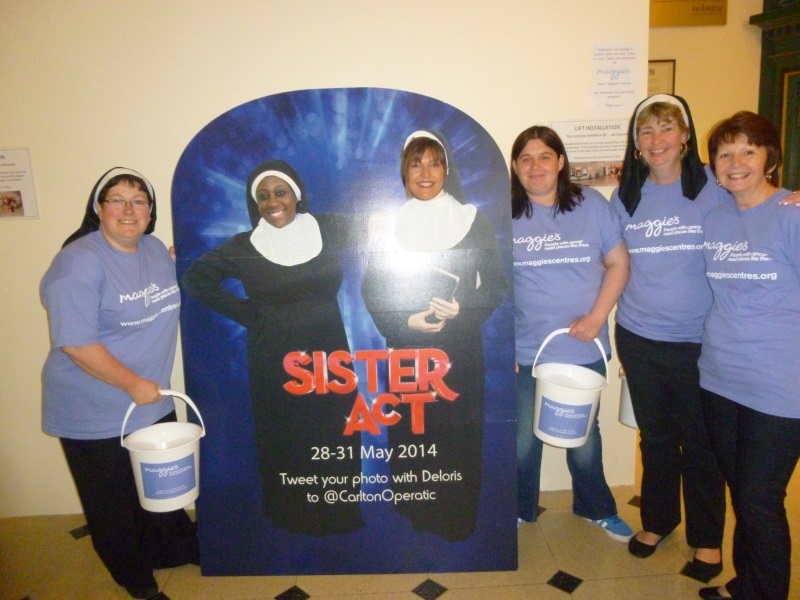 Carlton Operatic Society would like to thank all those that made contributions during our performance of Sister Act at the Nottingham Theatre Royal between 28th-31st May 2014 to our charity, Maggie's Nottingham. £732.00 was collected over the seven performances. Maggie's Nottingham has been our chosen charity for 2013-14 and to date including the collection at the theatre we have collected over £1000. Maggie's is a charity that provides free practical, emotional and social support to people with cancer and their family and friends. Maggie's centre can be found on the grounds of the Nottingham City Hospital. If you would like to find out more about the centre please visit their website. It was a special evening at the Carlton Operatic Society rehearsals for Sister Act for three very special long-term members of Carlton Operatic Society who received their long service medals from the National Operatic and Dramatic Association. 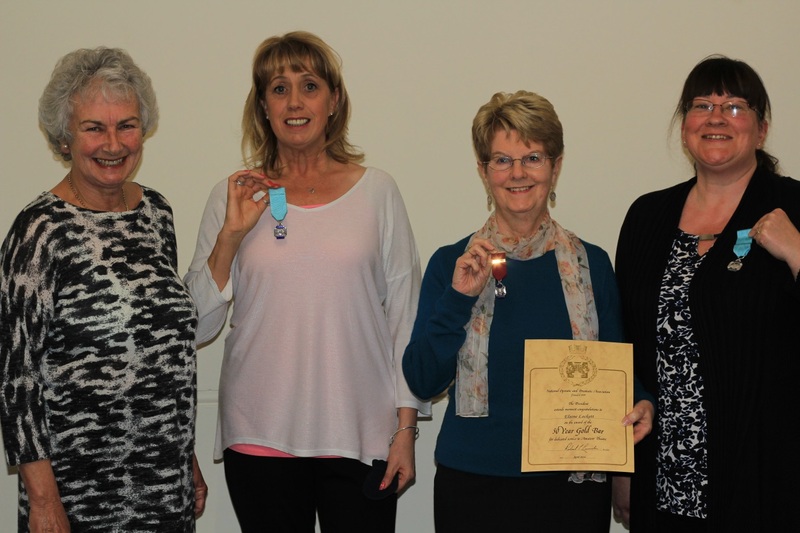 Elaine Lockett received her 50-year medal, and Jayne Allitt and Wenda Palmer both received their 25-year medals. The awards recognise an individual's commitment, support and dedication to amateur theatre. Presenting the awards was Julie Walton, Vice President who herself has been a member of the society for 52 years. In the century of combined service devoted by Elaine, Jayne and Wenda to Carlton Operatic Society they have played many different roles – not only by treading the boards (you can see Jayne playing Sister Mary Jane in the society's new production of the musical Sister Act at the Nottingham Theatre Royal at the end of May), but also behind the scenes. This has included working backstage, committee responsibilities (all three have served on the society committee for many years, and Elaine is joint Vice President of the society with Julie Walton), running the costume department, sourcing and managing stage props, and organising the social activities of the society. Elaine said "My family has been connected with Carlton Operatic Society since 1933, and it's wonderful to see how the Society has developed over the years. We will always need young people to join us to ensure that the society continues to thrive, and in turn those who join will experience the thrill and excitement of live theatre, as I have enjoyed over the past 50 years". If you are interested in becoming a member please contact us. This page was last updated on 19 May 2017.